Franciscan Focus: Cmdr. Quinteros and Fr. 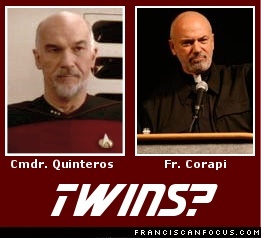 Corapi: Twins separated at birth? Cmdr. Quinteros and Fr. Corapi: Twins separated at birth? Earlier tonight, Husband Mike and I watched a rerun of the Star Trek: The Next Generation episode, "11001001". When one of the guest characters, Commander Orfil Quinteros, strode onscreen, my first thought was, "OMG, it's Commander Father Corapi!" Wow indeed - I had to actually go to IMDB to see who the actor is! Ultra funny and no mere coincidence... or maybe. Pretty awesome though. Never made the connection.